The Euclid Avenue Congregational Church was the victim of a fire in the early hours of Tuesday morning. Lightning is suspected as the cause. Demolition began within hours. As of noon today, this is all that remained. The church, at 9606 Euclid Avenue, was built in 1884-1887. 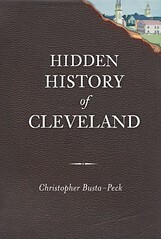 The architects were Coburn and Barnum, a firm responsible for many of the great Euclid Avenue homes. The building was a Cleveland Landmark. The following text, describing the construction of the church, was published in Church Building Quarterly in 1888. An drawing of the church accompanied the article. 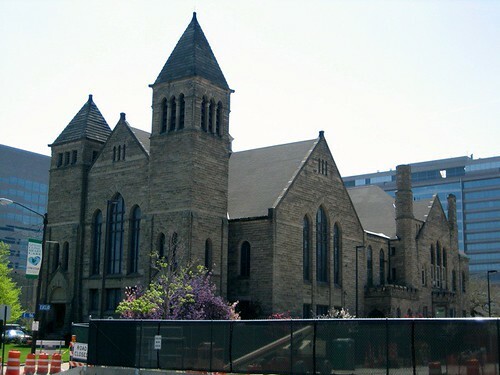 The church was very well maintained, as illustrated here, in this photo taken during the construction of the adjacent Cleveland Clinic building. 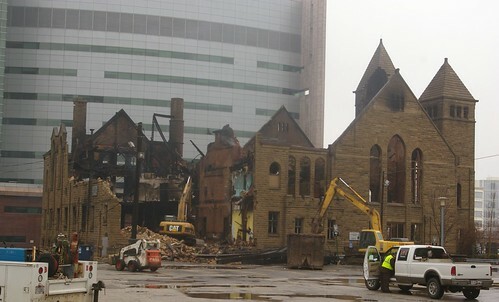 In the aftermath of the fire, additional photos of the church, including the interior, have been posted on the Cleveland Memory Project. The Western Reserve Historical Society has posted a finding aid describing their archival collections of material relating to the church. 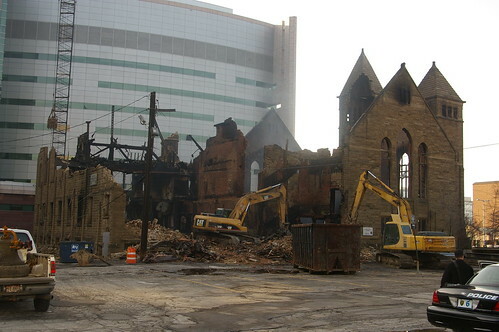 Demolition of the church began shortly after the fire was put out. By 1 pm on Tuesday, considerable progress had already been made. By 6 pm, this was the scene. Note how much of the wall closest to the Cleveland Clinic had already been lost, as well as the wall closest to the camera. Smoke (or dust) appears to still be coming from the ruins. Here are some more photographs I took of the demolition. 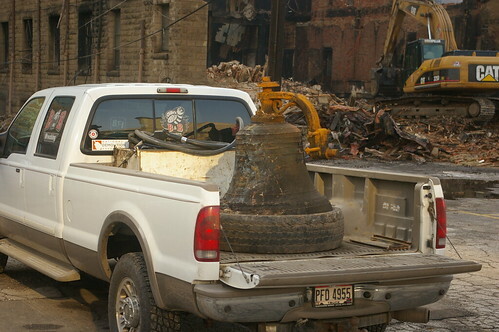 This bell was salvaged from the church. It has been used in each of the three buildings occupied by this congregation. A pile of steel I-beams, likely bound for the recycler, was also separated from the rest of the debris. The remainder of the stone, brick, and other material was being loaded into dumpsters, probably bound for the landfill. I want to express my sympathies for the congregation that has lost their home, and for the community, which has lost this stunning landmark. It seems wrong that the building was demolished so quickly. While I understand that the building was beyond the point of repair, and that there were serious public safety concerns, I have to wonder if there wasn't some way pedestrians could have been protected from the potential of falling debris while the situation was given some thought. Even as a burned-out shell, it was an impressive structure. Could some part of it have been stabilized as a ruin, as has been done with so many historic European churches? The tower of St. Agnes Church, just down the street, was saved, and remains a landmark in the community. Could we not have done something similar with this one? The Cleveland Landmarks Commission exists to represent our interests in matters such as this. If you find the course of action taken unacceptable, I suggest contacting Robert Keiser (rkeiser@city.cleveland.oh.us), secretary of the Landmarks Commission, and Donald Petit (dpetit@city.cleveland.oh.us), City Planner. I saw that! I was on my way to have my wisdom teeth taken out that morning. 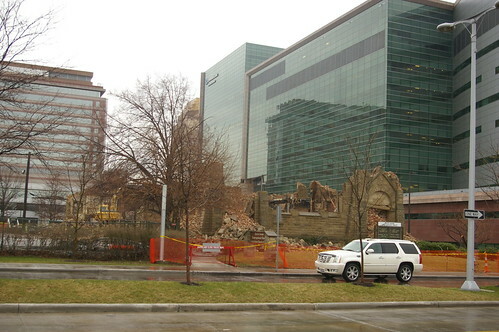 I thought it was just another demolition by Cleveland Clinic. I shouted to Liam as we drove by, "Look at that beautiful church being torn down!" and at that point they were hosing it down. I saw the face of it, the empty shell, and I really felt sad. Is there an investigation into what caused the fire going on? The article in the Plain Dealer said that there was going to be an investigation. I don't know how much of an investigation they'll be able to have given that the structure has been demolished. true. Yeah, I guess the paper said there's surveillance camera footage showing a giant lightning bolt hitting the church. That's mind boggling that it stood there for 126 and that is how it saw its end. I wish that something more could have been done. Demolition was probably just the cheapest option. This church was beautiful ~ my children called it "the castle" each time we drove by. I am sorry we never got a chance to see the inside. Unfortunately, many people ~ not all ~ in this country do not value the hisotry that is so important to our lives in the United States. The frame of mind seems to be "knock it down and rebuild." It is a very sad attitude to have. I am very suspicious about the expediency of the demolition. I agree that it could have been left standing for a short term until it's final fate could be determined. The church stood there for over 100 years and I imagine its structure was much more stable than any building that is built these days! It was a HISTORICAL LANDMARK!!! I just hope that the clinic does not try to make a land grab and that the congregation can "recreate" something similar to the beautiful church that will surely be missed. I would be glad to spend some of my time to volunteer to help them! It is terribly unfortunate that a congregation could lose their place of worship and fellowship to a fire that I believe was not a result of natural causes. If in fact it was a lightening strike where are the videos that the Clinic supplied to the Cleveland Fire Department? Could it be that the Executives for Clinic was tired of the historic landmark because it did not fit their scheme of things? If I were a member of that congregation I would want those videos to become public knowledge. Just something to think about. What ever the case everything that happens is by divine appointment. Therefore the leadership of Euclid Congregational Church need to ask what is God trying to tell them. Just about the only human, historic presence on the Clinic's faceless campus is that of the old churches, which remind us of what Euclid Avenue once was and signal that the neighborhood remains a place for spiritual as well as physical health. The speed of Euclid Congregational's removal was unseemly, to say the last, and should be explained. Was it a health hazard? A traffic hazard? I don't think so. I find it ironic that a ruined beautiful old church can be so swiftly erased when so many ugly, vandalized former factories still stand, irresponsibly abandoned by their owners. Certainly something could have been done to save portions of the church. I did not know about this until now and certainly there are history loving, caring professionals that could have helped developed a plan to salvage things. My sympathis to the congregation and all the locals who took pride in this building as part of the Cleveland Landscape. I may sound harsh, but those in charge of the demolishing owe the citizens of Cleveland a far better and more detailed explanation. The church was not only theirs but the community's. Is the stone being saved? We are such an advanced society compared to when earlier fires took place, there is certainly something that could have been done. As Moderator of the congregation of EACC, I can say with certainty that the demolition of the building was ordered by the City of Cleveland, and the demolition crew was hired by the city. The building was a total loss, no doubt because it had a wooden ceiling and superstructure. The insurance company is making a thorough investigation of origin and cause, as a total loss of this kind is somewhat rare, I'm told. There were many lightning strikes in the area that night, including one that knocked out the electrical power of the nearby Ronald McDonald house, according to Cleveland firefighters. A study of lightning in the area is part of the insurance company's investigation. I understand that both the Cleveland Fire Department and the Bureau of Alcohol, Tobacco, and Firearms (whose involvement is mandatory in church fires) have declared this fire to have been officially caused by lightning. Some stone is being preserved but not in any organized, systematic manner. The bell and large nameplate sandstone block have been preserved, and the "1886" cornerstone, bronze plaques, time capsules, and some few artifacts will be. I loved this Church. It was more than a building. It was a place where many people gathered from various backgrounds and were good friends! Seeing the photographs of the death throes of this beautiful church is very sad and very powerful. Has any thought been given to publishing a history of the church, from inception to destruction as a way of raising money for its re-building? The excerpt from the Church Building Quarterly and the photographs here and on the Cleveland Memory Project make me wonder if there aren't pictures/drawings of the interior that could be a part of a publication that celebrates this landmark. I think there is a public sentiment that would support such a project that could be tapped into. I am not a member of the church, but I'd buy the book to support Euclid Avenue Congregational in the hope that they can rebuild on their home site. 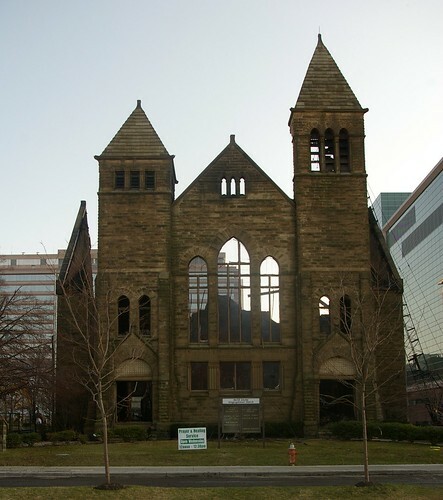 George, back in 1997, Carol Poh Miller did an excellent history of the church, titled This far by faith: the story of Cleveland's Euclid Avenue Congregational Church. The main reason why I haven't written something about the history of the church already here is because she did such an excellent job already. Who's kidding whom? The Lord High CEO of CCF probably broke records getting in touch with the powers-that-be to have this landmark [which'd long been in the way of Clinic expansion] demolished. Save some of it? Puh-lease.This former house of God was vanished from our landscape faster than Kreskin making a silver dollar disappear. Romans built massive structures with no mortar that remain breathtaking & water-tight 2,000 yrs.later. Today we build ugly steel & glass boxes (someone once coined these glass eyesores 'sh*t-a-brick') that, without constant upkeep, would vanish completely in less than 500 years. Not only that, but the almost all-glass buildings popping up across this nation are obscenely rich institutions thumbing their noses at the impending energy crisis. I saw the Clinic's Hillcrest Hospital Medical Building & it was almost pure glass. How much will patients & clients need to fork out extra to pay for heating these monstrosities? When will learn to save, even if only a portion, these truly beautiful works of art built of hewn stone & love which only grow more elegant with age, if only to remind future generations of what once was & could be again.